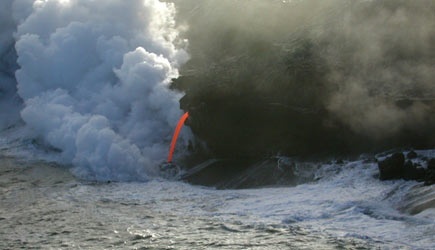 Kilauea Volcano is the most active volcano in the world and it has been continuously erupting since 1983! The Hilo airport is just minutes away from the active lava flows and an aerial perspective of the volcano will give you an appreciation for how Hawaiian shield volcanoes create and sculpt the land. We offer two types of helicopter tours from Hilo depending on the level of adventure that you seek. Doors Off Lava and Rainforest – 50 min. A helicopter with no doors … the wind in your face … 2200 degree molten lava below … Enliven your senses on your Kilauea Volcano flight by feeling the heat and smelling the sulfur of the world’s most active volcano! Fly in a Hughes 500 (the Magnum PI helicopter) which seats four passengers and offers all-window seats. Your adventure begins with checkin and a safety briefing at the Hilo Airport general aviation tour area in Terminal 2. Your flight departs from the airport en route to the Kilauea crater and offers views of Hilo Bay, tropical rainforests of Puna, and the world famous Mauna Loa Macademia Nut Farm. Once you reach the volcano you’ll see current and recent areas of activity including any lava ocean entry points and Pu‘u O‘o, the volcanic vent that has been the focus of nonstop volcanic activity since 1983. 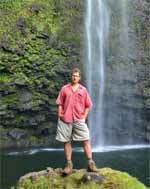 On your return to Hilo you’ll see beautiful Rainbow Falls and other cascades of northern Hilo. This is a 50 minute flight. Restrictions: This flight is not suitable for children under the age of 10. What to Bring & Wear: Passengers should wear comfortable clothing including a sweater/jacket and long pants. Doors On Lava and Rainforest – 50 min. 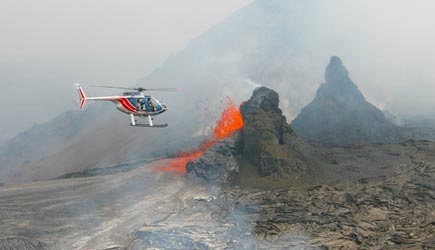 Fly to the volcano in luxury and climate controlled comfort on board a 6 passenger Bell Jet Ranger. Your adventure begins with checkin and a safety briefing at the Hilo Airport general aviation and tour area in Terminal 2. Your flight departs the airport and offers views of Hilo Bay, tropical rainforests of Puna, and the world famous Mauna Loa Macademia Nut Farm en route to Kilauea. Once you reach the volcano you’ll see current and recent areas of activity including any lava ocean entry points and Pu‘u O‘o, the volcanic vent that has been the focus of nonstop volcanic activity since 1983. On your return to Hilo, you’ll see beautiful Rainbow Falls and other cascades of northern Hilo. This is a 50 minute flight. Five out of 6 seats on this helicopter are window seats and the one that is not has an excellent view out of both sides of the aircraft. What to Bring & Wear: Passengers should wear comfortable clothing and dark colored shirts to reduce glare on the windows. Reservations: Preferred seats are $25 for tour with doors. Preferred seat selections will guarantee you a window seat but are subject to weight and balance restrictions. Restrictions: Due to spatial limitations, additional fuel charges, and aircraft maintenance demands, the following capacity surcharge policy applies to these flights. Guest weight is determined by a mandatory scale reading at check-in. All guests weighing between 265 and 315 lbs will be assessed a Capacity Surcharge (CS) of $50. The guest will be guaranteed a window seat. All guests weighing over 315 lbs will be assessed a Capacity Surcharge of an extra seat, for weight and balance purposes. The rate of the extra seat will be determined by the specific tour that they are booked on. This cost is calculated by adding an additional seat to the one that has already been purchased. The guest will be guaranteed a window seat. Hilo Cruise ship passengers are able to do any of these helicopter tours from Hilo but availability is very limited when ships are in port and your reservation should be made weeks in advance of your date! 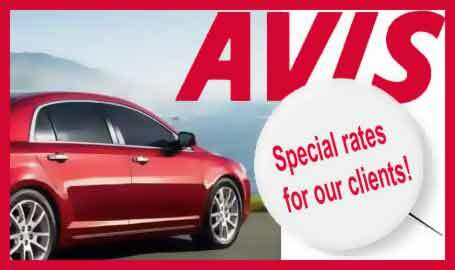 A short cab ride of less than 5 minutes is required, or you can ride a rental car shuttle if you are renting a car for use before and after your flight. Yes, helicopter tours are expensive. Honestly though, people don’t come to Hawaii to save money. They come in search of the complete Hawaiian experience. The reality is that there is so much beauty in Hawaii that cannot be seen in any other way except from the air, that the high cost of helicopter tours becomes worth it for those who seek the ultimate in their vacation experience. When you consider the thousands of dollars spent on airfare, meals, and accommodations on a Hawaii vacation, it only makes sense to spend a few hundred dollars more and REALLY see the island while you are here. These helicopter tours depart from the Hilo airport. Hilo is close to the Kilauea Volcano and flights from Hilo are the most affordable way to see the active volcano from the air. If you are staying in the Kona or Waikoloa resort areas, you’ll have a long drive to get to Hilo. The advantage of having your own rental car is that you can also drive up to see the volcano from the ground after doing your helicopter tour. Allow an entire day for the drive to and from this side of the island from the Kona side. Tours on this page are done is two different models of helicopter. The first is a Hughes 500, which is the helicopter of Magnum PI fame. It seats four, two passengers sit up front with the pilot, and two more sit in the rear. With this configuration all passengers get a window seat. While this helicopter can be flown with doors on or doors off, the doors off is hugely popular and the tour operator leaves them off for all flights. Because this helicopter is not climate controlled, passengers need to dress for cooler temperatures and cold winds aloft. Long pants and a sweater/light jacket are sufficient. Note that this helicopter is only available at the Hilo Airport and there is only one flight option … the 50 minute tour. The other helicopter model is a Bell Jet Ranger which seats 6 passengers. This model helicopter is very spacious and comfortable, and the interior feels a little like the inside of a limosine. One passenger sits up front with the pilot (sort of like riding shotgun), a second row of two seats faces the third row of three seats. With this arrangement five out of the six seats in the helicopter are window seats, and that one seat in the middle in the third row is NOT a bad seat as it has good views out of BOTH sides of the helicopter. Typically when the pilot hits a particularly scenic spot he or she will make a first pass on one side of the helicopter and turn so that the other side of the helicopter gets the same view. This middle back seat gets the view both times and one tour company staff member I talked to says this is his favorite place to sit! The Hilo Fire and Falls Adventure is the best option for guests who aren’t up for the “doors off” helicopter. Seating is assigned in the helicopters based upon body weights and the best balance of the aircraft. While it is possible to pay a little extra to guarantee particular seats, we find that the cost is not worth it. If you request a particular seat and you don’t fit the weight and balance profile for that seat on that particular flight, you’ll get moved to another seat anyway (and the upgrade fee will be refunded). If you do fit the weight and balance profile for that seat, the chances are good that’s where you’d end up sitting anyway …without paying extra. Because the Bell Jet Ranger has 5 window seats and the one seat that isn’t a window has very good views out of both sides of the aircraft, we recommend that you avoid paying extra to secure any particular seat. If money isn’t an object for you and you do want to spend extra to reserve a particular seat, give us a call after you fill out the form on the right side of this page. We’ll add your specific seat requests to your reservation and let you know if you fit the profile for the seat you’ve requested. The preferred seating request is $50 extra per person. A word about children flying on these tours. The doors off helicopter normally has a minimum age of 10. Most kids younger than that will be a little reluctant to experience such an extreme adventure. If you have a child who is a little younger than that but is particularly fearless, the tour operator will probably OK it … but be aware that if you push your child to do the tour and then they back out at the last minute, you will not get refunded because your child is afraid to do the tour. Kids are best flown in the helicopter that has doors on it. As a matter of fact, there are no age restrictions at all on the Bell Jet Ranger. Child policy is the same on this helicopter as it is on a commercial airliner. Children 2 and older will require their own seat and will pay the same fare as an adult. Infants under the age of 2 are seated in the lap of a parent and fly for free. One other little feature that’s nice … all of these helicopters have two-way communication between the pilot and the passengers. You can talk to the pilot … and to each other … during the tour. Check out our Kona Helicopter Tours too!